We all know the frustration of having an incredible idea hit you in the shower only to have it slip away before you could write it down. 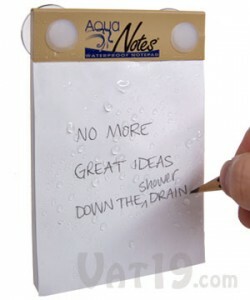 Now you can jot down those ideas with the AquaNotes Waterproof Notepad. The waterproof pad features 40 perforated sheets so you can take your ideas, lists, and plans for fixing the government wherever you go.